It is impossible to conceive of a change of one’s person from one state to another in any way other than one subject to the law of causality. If, therefore, one passes from a state of need to a state in which the need is satisfied, sufficient causes for this change must exist. There must be forces in operation within one’s organism that remedy the disturbed state, or there must be external things acting upon it that by their nature are capable of producing the state we call satisfaction of our needs (pp. 52-53). The “causal connection” described in the second prerequisite is due to this law of causality. It is difficult to grasp the author’s meaning of real good apart from this law. Disappearance of specific human need due to either internal or external changes. This change leads further to the disappearance of the capability of the previously real good to satisfy the previous need. Disappearance of causal connection between the thing and the human need due to change in the properties of previous real good. Disappearance of the command over the previous real good making men incapable to directly use it to satisfy a human need. Unreal goods or imaginary goods are things that fail to comply with the four basic prerequisites to be qualified as real goods, but accepted as goods based on public opinion. This is an important economic distinction for it affects the way people see the world. Knowing this distinction helps you understand why economic literature keeps on repeating that the study of Austrian economics is capable of equipping people to see the real world. Things that according to public opinion possess the four prerequisites, but in actuality do not have them. Menger describes the properties perceived by the public existent in imaginary goods as “imaginary properties.” Examples of such kind of imaginary goods are “most cosmetics, all charms, the majority of medicines administered to the sick by peoples of early civilizations and by primitives even today, divining rods, love potions, etc.” (p.53). This kind of imaginary goods does not have the capacity to actually satisfy the needs it claims to serve (p. 53). The second kind of imaginary goods claim to meet non-existent needs or imaginary needs. Examples of such kind of imaginary goods are “medicines for diseases that do not actually exist, the implements, statues, buildings, etc., used by pagan people for the worship of idols, instruments of torture, and the like” (p. 53). The author identifies two interesting observations about the relationship between real and imaginary goods. He claims first that the popularity of imaginary goods is an indication of low levels of civilization. As society progresses towards higher level of civilization, and as people see “more deeply into the true constitution of things and of their own nature,” the number of real goods will keep on increasing and the number of imaginary goods will decline (p.53). Secondly, Menger describes it as an obvious fact that imaginary goods are widespread among societies that do not have free access to the abundance of real goods (pp. 53-54). Returning to the discussion on two kinds of real goods, one important insight that Menger provides is the idea of “special class of goods” called as “relationships” (the original German word has no English equivalent. The closest is “relationships” and the other potential translation is “intangibles” p. 54). Examples of this class of goods are “firms, good-will, monopolies, copyrights, patents, trade licenses, authors’ rights, and also, according to some writers, family connections, friendship, love, religious and scientific fellowships, etc.” (p. 54). In explaining this special class of goods, the central idea is that human action and inaction are real goods. We already mentioned, under this category of real goods, labor services are the most significant. However, not all human actions are labor services. Examples of these are customers buying commodities from an entrepreneur and clients asking for legal services from lawyers. These are no labor services on the part of the customers and clients, but their actions are useful to both the entrepreneur and lawyers; and so these actions are real goods. Even relationships of friendship and love, religious fellowships, and the like, consist obviously of actions or inactions of other persons that are beneficial to us (p. 55). 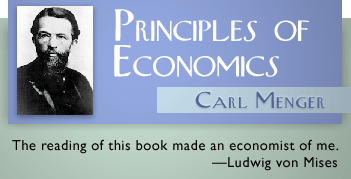 It is great to know that the founder of Austrian school of economics has this “holistic” concept of the good. We have seen that under his discussion of “special class of goods” and human action and inaction, he included those intangible real goods. I think his idea can serve as a corrective to a purely materialistic understanding of “goods” that is prevalent today. However, one must be cautious on the other hand about the tendency to “commercialize” these intangible goods. Thank you for this informative post on economics. Is it possible that a “real good” can have a “special kind of good” as its surplus? Is also possible that a “special kind of good” can really turn into a “real good”? If you have time, can you further elaborate “law of causality” and “causal connection”? About “causal connection,” the idea is that under the category of “real goods,” there are actually different orders of goods. These orders do not refer to inherent properties found in goods themselves, but to the precise place of specific goods in what Menger calls as “causal nexus of goods.” For instance, labor services of farmers are necessary to produce wheat; then wheat through tools and skilled labor can be turned into wheat flour that will finally be used in baking bread. The farmers’ labor, wheat in its raw form, tools and skills to make wheat flour, wheat flour itself, and finally bread are all real goods. They belong to different orders of goods (1st order, 2nd order, etc.) when it comes to proximity of distance in satisfying hunger. As long as each of this good functions in its proper place, the good has this “causal connection,” which qualifies it as “real good.” I hope my brief explanation helps. Thanks John for your question. It helps me process Menger’s ideas. You’re welcome John. I am now on page 58 of Menger’s Principles. So far, I never encountered yet his idea about “surplus.” Yes, if I correctly understand Menger “special class of good” is just one part of “real good.” So in that sense, you can say that both “real good” and “special class of good” are one and the same. The only difference is that the former is a bigger category where the latter is a part of it.